Please note that clear PVC pipe has a slight blue / grey tinge to it and so should not be expected to be 100% optically clear. Clear pipe is typically used for sight glasses, process viewing and demonstration units. Other clear elbow fittings are available up to 8". EVICLEAR WRAS Approved 1/2'' Clear PVC 90 degree elbow. Designed to take 1/2" Pipe - which has an outside diameter of 21.4mm. EVICLEAR WRAS Approved 3/4'' Clear PVC 90 degree elbow. Designed to take 3/4" Pipe - which has an outside diameter of 26.7mm. EVICLEAR WRAS Approved 1'' Clear PVC 90 degree elbow. Designed to take 1" Pipe - which has an outside diameter of 33.4mm. EVICLEAR WRAS Approved 1 1/4"'' Clear PVC 90 degree elbow. Designed to take 1 1/4" Pipe - which has an outside diameter of 42.2mm. EVICLEAR WRAS Approved 1 1/2"'' Clear PVC 90 degree elbow. Designed to take 1 1/2" Pipe - which has an outside diameter of 48.3mm. WRAS Approved 2'' Clear PVC 90 degree elbow. Designed to take 2" Pipe - which has an outside diameter of 60.3mm. 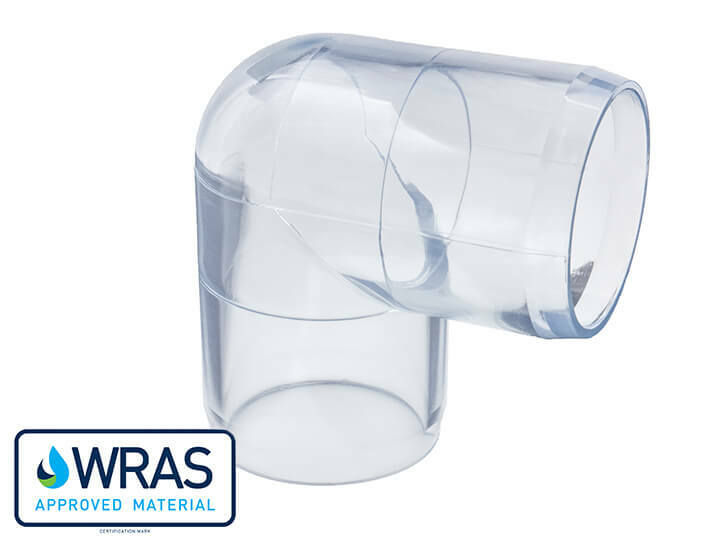 WRAS Approved 3'' Clear PVC 90 degree elbow. Designed to take 3" Pipe - which has an outside diameter of 88.9mm. WRAS Approved 4'' Clear PVC 90 degree elbow. Designed to take 4" Pipe - which has an outside diameter of 114.3mm.